I publish a slang word or colloquial expression on our Facebook page every week. In this lesson, you will learn 3 of these words. I will give you real-life examples so you can get a feel for how they are used. 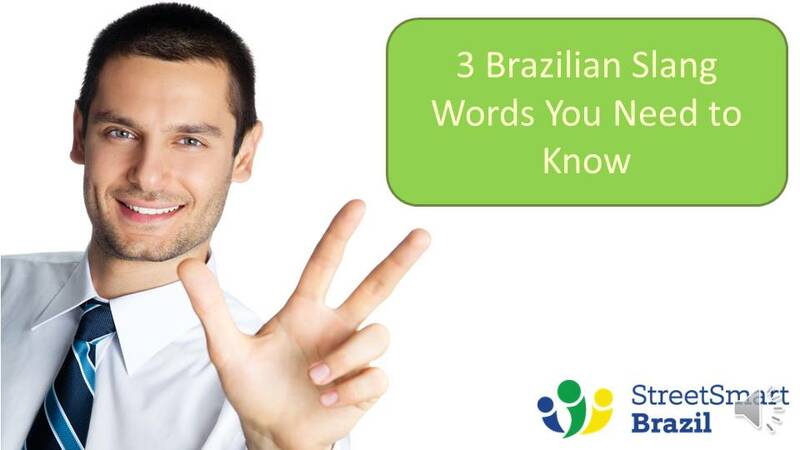 Keep in mind that Brazil is a very large country and we have different slang words in different parts of the country. The words I will show here are used all over Brazil, but some may be more used in some parts of the country than in others. It seems that every Portuguese learner quickly learns the word legal. Bacana is a synonym. It means: cool, nice, good. The word bacana remains the same whether you are talking about a man or a woman. Sofia and Liane are going to the movies. Sofia: Que filme você quer ver? Liane: Ouvi dizer que o novo filme do Kleber Mendonça Filho é bem bacana. Sofia: What movie do you want to see? Liane: I heard that the new film by Kleber Mendonça Filho is really cool. Sofia: Quero te apresentar ao meu amigo João. Ele é um cara muito bacana. Sofia: I want to introduce you to my friend João. He is a great guy. The feminine of moleque is moleca. The context will tell you how the word is being used. When it relates to age, people often use the word moleque to refer to someone of a younger age, even if that person is not exactly a kid. For example, José is 60 years old. André is 30. José may refer to André as a moleque just because André is very young from José’s perspective. Eduardo: E aí?!! Há quanto tempo! Esse é o meu moleque, Tiago. Eduardo: Hey! It’s been a while! This is my kid, Tiago. Milena: Não faça negócios com o Arnaldo. Ele é um moleque e não merece confiança. Milena: Don’t do business with Arnaldo. He doesn’t have good character and is not trustworthy. Nó literally means a knot. Nó cego = dead knot. Diana and Jessica work in the same company. Jessica: Estou trabalhando num projeto que é um nó cego. Não sei o que fazer. Jessica: I’m working in a very complicated project that is full of problems. I don’t know what to do. Diana: Meu sobrinho Márcio é um nó cego. Está sempre criando problemas para todo mundo. Diana: My nephew Márcio is a big problem without apparent resolution. He is always unemployed and always creating problems for everyone. Learn family vocabulary with our flashcards. Practice your new vocabulary to use it with confidence. Street Smart Brazil offers Brazilian Portuguese lessons via Skype. It is a simple, convenient, and effective way to learn Portuguese.